Got Party Pig pouches that need to be activated? 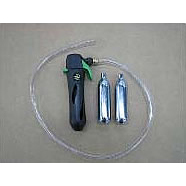 The Hog Wild Activator Kit helps you do it faster and easier. The kit comes with an activator and two 16g food grade cartridges. You can activate 4-6 party pigs from just one 16g cartridge.